Since showing at the Erewash Borough Museum the exhibition 'Future/Past' has morphed into a new show- 'EnsembIe'. Rachel Eite's installation piece will be spectacular in the large glass ceiling/window space and you can get up close and personal with more Frillip Moolog beings (sculptures). Kirsty will be exhibiting four 'beings' in the intimate setting of the rear gallery room. The Hand and Heart Gallery has a good vibe and is in demand as one of Nottingham's new exhibition spaces. 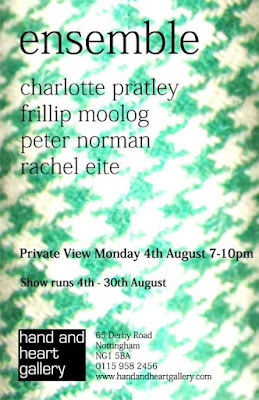 Come along to the Private View on Monday 4th August meet the artists and discuss the work on show.